Here is another scrumptious treat for peanut butter lovers out there, a dessert bar made from creamy peanut butter and peanut butter chips. Salted chopped peanuts balance the sweetness and add crunch while chocolate chunks make the these bars more decadent. 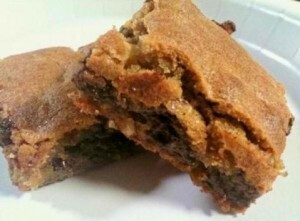 Here is an easy dessert recipe for Peanut Butter Blondies. Pre-heat oven to 350 degrees F. Line a 9-inch square baking pan with parchment paper, letting paper extend at two sides. Spray parchment with nonstick spray. In another bowl, beat peanut butter and butter with an electric mixer on medium speed, until smooth. Add brown sugar and granulated sugar and beat until well blended. Add the eggs, 1 at a time, beating thoroughly after each addition. Pour in vanilla and mix until well combined. Add the flour mixture into the butter mixture and beat on low speed until just blended. Fold in peanuts, peanut butter chips, and chocolate. Scrape dough into prepared pan and spread evenly using a spatula. Bake blondies for 35 minutes or until a tester inserted in center comes out clean. Place pan on a wire rack to cool completely. Remove from pan by lifting the excess parchment on both sides. Place blondies on a chopping board and cut into bars using a serrated knife.